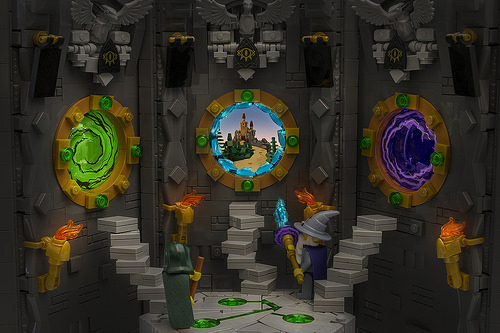 Magical swirls, bright colours, and mysterious runes might impress you in this portal hub scene by LEGO builder Chris Perron, but with a bit of thought you realize it is just a glorified crossroad, which seems as magical to us as cars would to someone using a portal transport system. There is so much to love in the scene. The swirling, colourful portals are highlighted in post-production to give an immersive magical feeling. The green runes on the floor add a bit of mystery, along with the eye symbols and other decoration on the walls. The real star is the forced perspective castle in the central, blue portal and how it is lit in beautiful sunset colours.